New bookmaker Sun Bets are offering a £10 Free Bet to all new customers when they sign up via our special links using the Bonus Code G10. What are you waiting for? Claim your £10 free bet right now! 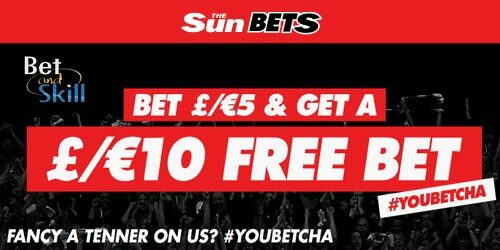 Sun Bets is the exciting new sportsbook site for which The Sun newspaper has teamed up with Tabcorp Holdings Limited and they are offering all new customers a £10 free bet. Find below how to get your free tenner in a few simple steps! Your £10 Free Bet will be credited to your account! Casino players are in for an extra reward, with a whole series of offers, starting with a 100% first deposit match bonus that can be worth up to £100, along with 25 free spins on top slots like Captain America, Age of the Gods and Mr. Cash Back, and even £5 completely free to use at their thrilling live dealer tables. Sun Bets Casino brings you the experience of a real life casino straight to your mobile and desktop. With over 250 slot and table games plus a live casino available at the touch of a button, the Sun Bets casino is the place to be. Offer is only available once to new customers who sign-up using valid promo code G10. A qualifying bet is a bet of £/€5 or more placed at minimum single odds of 1/2 (1.5) on any sports market. Non-runners, void or cashed out bets will not count as qualifying bets. For each-way bets, only the win component of the bet will count towards the qualifying requirements. Your free bet cannot be used as a permed accumulator. A maximum £/€ 10 Free Bet will be applied to your account within 48 hours of you placing your qualifying bet. Winnings from free bet excludes stake. Free bet will expire after 30 days if unused. This offer can be used in conjunction with any subsequent offers. Offer can be withdrawn at any time at Sun Bets discretion.